Blue America was the very first group outside of Wisconsin to endorse Randy Bryce for his congressional run against Speaker Paul Ryan. 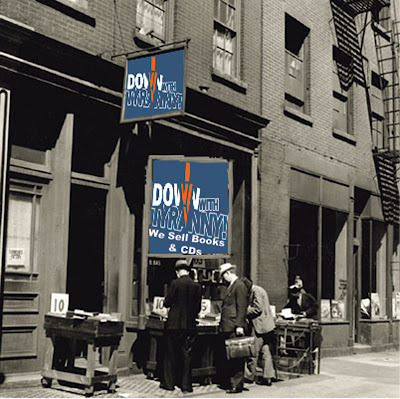 We helped him find a staff and get his campaign going. And Randy has been an inspiration to our work and to many other progressive candidates around the country, especially candidates from working class backgrounds who have been made to feel through Randy that working men and women belong in Congress-- right along with businessmen, wealthy people, military officers and attorneys. 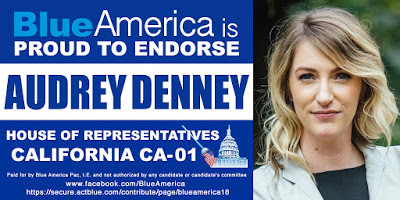 Today Blue America is endorsing one of those candidates, Audrey Denney, who is taking on conservative Republican Doug LaMalfa in California's first district, way up in the northeast part of the state, recently devastated by wildfires. Audrey, who was born and raised on her family's farm, was foreclosed on while she was teaching agriculture at Chico State University. Last year she shocked everyone by holding LaMalfa to just 54.9%. She expects to finish the job in 2020. "For me," she told us this week, "Randy Bryce is the model of saying 'enough is enough' to the pay-to-play status quo and fighting for working people. I was inspired along with millions of other Americans by his message of fighting for an ecomony that works for the people that work the hardest-- working families. The rise in income inequality in our country can be traced to the decline in the strength of our unions. Randy Bryce’s work to protect and strengthen our unions is of critical importance to level the playing field in our country. "I believe we won’t have true representation in Congress until more working class people are elected. As an educator, I’ve lived pay check to pay check my entire life. My family lost our home and the farm I grew up as a result of the 2008 recession. While I was teaching at the university level, I had to bar-tend at the same time, to make a living wage. I understand the struggle of the majority of Americans-- because I am one. I’m running for the U.S. House of Representatives to fight for working familes and the real people who live here in California’s first district. We’re fighting to make sure everyone has healthcare, students can get quality education to prepare them for careers, and that everyone can participate in our economy." My good friends at Blue America-- Digby, John, Jacquie and Howie-- are already chomping at the bit to get people fired up for the 2020 cycle. When we decided to enter the race-- part of the reason we wanted to get an early start was to help get people fired up and excited to take back the House of Representatives. While our own race wasn’t as successful as we would have hoped, we did manage to take back control of the House. Our country depended on it. We can now see that Donald Trump doesn’t know how to react when he doesn’t get his way. This is a testament to all of your hard work, and, groups like Blue America who have been with us every single day-- fighting for progressive values. I’m thrilled to see Blue America already have a great candidate lined up ready to take another shot. I plan on being involved with the upcoming 2020 race. 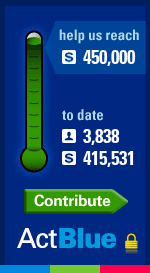 (not necessarily as a candidate) We saw that when we jump in early, it really helps us gain momentum. This next cycle we will have the opportunity to take back not just the Senate, but to replace the person currently residing in our White House. Of course, we need to keep control of the House, but, it would be nice to add some more new faces. Looking forward to working with all of you again-- please help me support Blue America and Audrey Denney in any way that you are able. Anyone Looking For A Job In DC?